The Full Moon night brought two strange dreams. The first was dreadful and disgusting while dreaming it. In the dream my bed was full of little animals like worms, insects and caterpillars – the caterpillars came last, all in striking colours and funny faces. Now I’m awake and thinking back, they all looked very funny, but still…. The next one was strange too. On a market, I bought an Iguana, a Tiger and a Panda Bear in a huge cage and took them home. There I realized, that this was a very strange combination of animals in one cage and they probably would eat each other, mainly the tiger the other two. So what to do? b) I would never ever have enough money to sustain a good living and food for them. Here I woke up wondering what that was all about. Looked the animals up with animal totem explanation. A time to examine and digest what has occurred in our life, cast off what is not beneficial or necessary, clean house emotionally, new growth. They ask to sail in a smooth course, to stop sometimes and then continue again to flow with self. Don’t tarry and certainly not stay with rotten decaying elements such as matters from the past that you already know well. They do not belong to your life anymore. Stop thinking about the past, old thoughts, memory and certain emotions as anger, blame, criticism, outrage and revenge. Let go, don’t refuse to act in a dynamic way again. • the ability to heal quickly, both physically and emotionally. Tigers are considered a yang energy. When Tiger enters your life, expect new adventures. It will awaken new passion and power. Listen to your own intuition above anyone else’s and pay attention to your dreams for they show you what to do. Gentle Strength – yet flexibility – quiet, unassuming essence – modest and strong at the same time. Focus is the key to all your endeavors. They eat bamboo thus the symbolism of bamboo is to be of importance. Bamboo combines upright integrity with accommodating flexibility; it has the perfect balance of grace and strength, or the Yin and the Yang. When the young shoots emerge from the roots, they are under the shade of the older bamboo branches. Such a spirit reflects the young respecting the old as well as the old protecting the young. Just while writing, the meaning and understanding is slowly forming. When living in Cologne in my young years, the package of me was mainly caged. In my adult years, I kept getting lost sometimes, making faults while learning my lessons. Now the time has come to combine the three stages of life and free me from the cage. Looking back it was not all that bad as it felt when being in it (dream nr. 1) and if I combine the dreams at least the Iguana had enough food to stay alive. With Iguana there is Contentment with life now, Awareness of all that passed and the lessons learned, Confidence about myself because I mastered so much and know now who I am, Expectation for the years to come, Contemplation on the way to follow and Appreciation of everything and everybody on my way up to now. If I follow caterpillar and worm I find the actions that will sustain finally me, the tiger and the panda. BABY need a new bed and matres because there are also crawling little animals like in my 1st dream. This year is pronounced the year of the starling. Very suitable regarding the new way of living in development: participation society – helping and working with each other instead of the eternal growth rat race.Starling teaches how to do this. Starling teaches how to behave within a group setting, etiquette, social standing and family relations and how you appear to the world in those relationships. He will show the nuances of the art of communication and vocalization which needs to be clear and expressive. It’s time to speak your voice, how to be effective and assertive without becoming a bully. Communication is important however, you must be careful what you say, for people may take it incorrectly or blow it out of proportion. Watch your own sensitivity to others words. You might be reading more into it that is truly there. Starling can show how to be a fierce competitor to achieve goals along with using all the resources available to do so. Are you balancing your feminine/masculine qualities? It is time to accomplish tasks early and not wait until the last-minute. Are you clinging to an idea, perception, people too tightly? Starling will teach much about sensitivity to others and working as a unity either in this world or another and will instill a sense of protection and hope. By learning Starling’s behaviors, you can live peacefully within your community of friends and family. 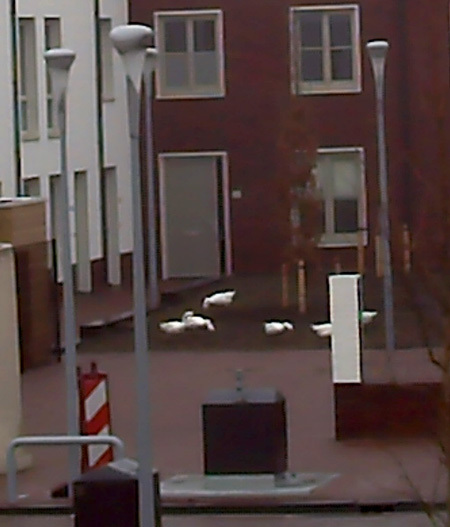 Today, early in the morning, a big group of geese took a sight-seeing tour through the street. Before the houses were build here, it was their home. 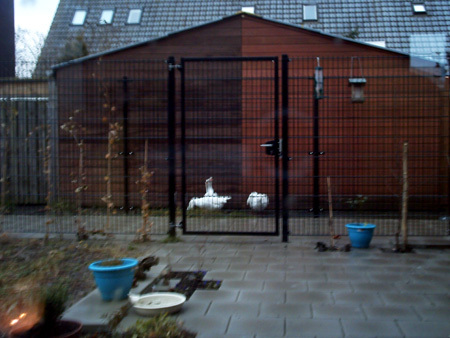 First they attend the courtyard across the street.This evening they visited the path at our backyards. And of course I fed them with some bread. Why feathered omen? Because goose is my birth totem from native American astrology. It’s a prolongation of what is said in my personal horoscope about starting anew and tuning into the original package of what was meant to be when born.I got all exited about this as you may understand. Birth and animal totem: Snow goose (December 22nd – January 19th). Season Aspect: The renewal time. Personality: Reliable, high standards of self. Positive traits: Ambitious, never gives up. Negative traits: Rigid, driven, often too focused on succeeding. Compatibilities: Beavers, bears and crows. Subconscious desire: To rest and rejuvenate. Spiritual Path: To learn patience and the flow of life. Keywords: Determination, perseverance, ambitious, resourceful, level-headed, self involved. 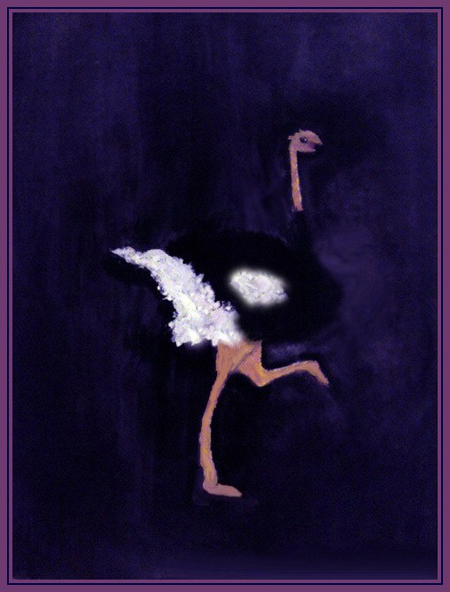 Birth totem goose is an individual whose outer personality is one of quiet determination and resourcefulness. As one who is born under the birth totem of goose goes about his/her daily life, they are conscious of the need to preserve all resources, both their own internal energies, and the resources of nature. Does this suggest that these individuals are lazy? Hardly, what it does suggest is that they know how to make the most out of their energy, plotting and planning their moves and steps along the Red Road of physical life so that they can produce the most effective results. Less conservation minded individuals will lay collapsed along the wayside, while goose is still plodding resolutely forward, eyes firmly focused on the goal ahead. Goose souls may become so single-minded in their drive to provide a safe nest for their mate and offspring that the relationship to these loved ones may suffer as a result. It is not from lack of love or caring that interpersonal relationships suffer, it is rather from their tendency to block out all but the singular goal lest they become distracted and waver from attaining their objective. This is the greatest stumbling block for goose as he/she may ultimately attain their beautifully feathered and sturdy nest, only to turn around when it has ultimately been achieved to find there is no mate there with which to share in the accomplishment. Because they can become so driven and focused, birth totem goose may lose sight of those aspects that make life truly enjoyable, the connection to other souls along the journey of life. And while their own personal integrity in how they approach and operate in life is almost always above reproach due to their high standards of honesty, the ultimate lesson for these souls to learn from goose is the need to balance material and physical aims with spiritual and emotional connections. Once goose recognizes that they need also preserve their relationships to others, then the unfolding of the souls higher intent of integrity through proper action can be achieved and the result is a beautifully woven, warm and full nest. ~ Used with permission with some small additions by Psychic Revelation.